The Slow Cooker Strikes Again! This Delicious Side Dish Hits The Spot Every Time! Creamed spinach always reminds us of the dinners we used to have when we were growing up, so we love making it these days, both for the taste and for the memories. While it’s traditionally made on the stove top, we wanted to come up with an easier, more hands-off approach that would allow us to get the same creamy flavor we know and love, without having to stand there stirring it. Enter: the slow cooker. While this method requires a little forethought, really all you have to do is mix your ingredients together and then throw them all in the cooker; the result is cheesy, creamy and thick…just how we like it! 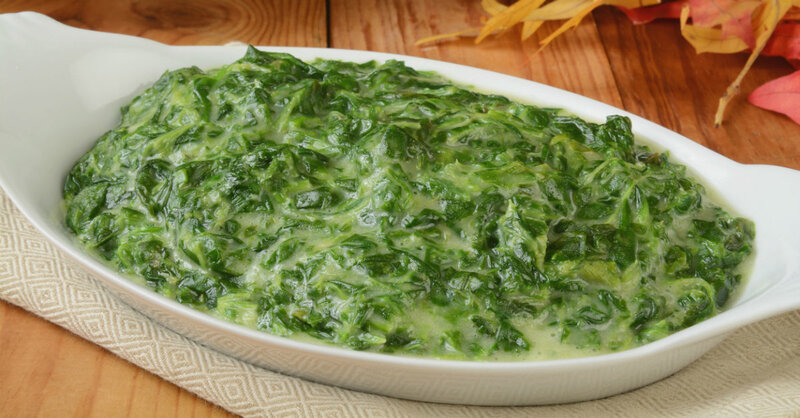 In a large bowl, mix together spinach, cottage cheese, eggs, parmesan cheese, American cheese, cream cheese and flour. Season with salt, pepper and nutmeg, then mix in cubed butter, just so that it’s distributed. Transfer mixture to greased slow cooker, cover and cook on HIGH for 1-1 1/2 hours (or on LOW for 3-4), or until edges are just starting to brown. Stir mixture all together, taste and adjust seasoning, if necessary, and serve hot.